The mermaid Soop has sent a flood to Fairy Haven! Water-talent fairy Rani must bring Soop a wand or the Home Tree and all the Never fairies will be swept away. But wise Mother Dove isn't sure which is worse, a wand or a flood. Wand wishes, tantalizing wand wishes, are risky. The most innocent wish can cause untold trouble. And not even Mother Dove knows that wands have hearts and minds—kind hearts or cruel hearts, sympathetic minds or minds filled with spite and mischief. Rani, Tinker Bell, and Ree, queen of the Never fairies, set out on a perilous quest for a wand, a journey that takes them across an ocean to the palace of the terrifying Great Wanded fairies. Many obstacles stand between the questers and success: Tink's disappearance, a mermaid's magical song, wand madness, and even Never Land itself. 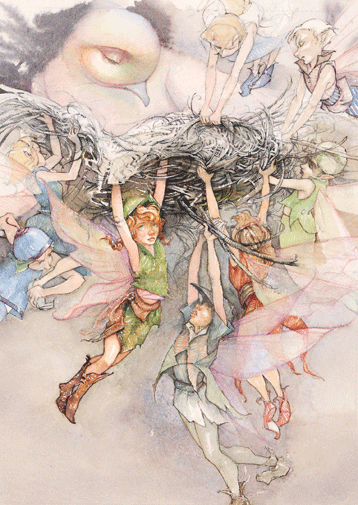 In this thrilling sequel to Fairy Dust and the Quest for the Egg, Newbery Honor-winning author Gail Carson Levine and illustrator David Christiana have conspired to spin a riveting fairy tale about the dangers of dreams coming true.